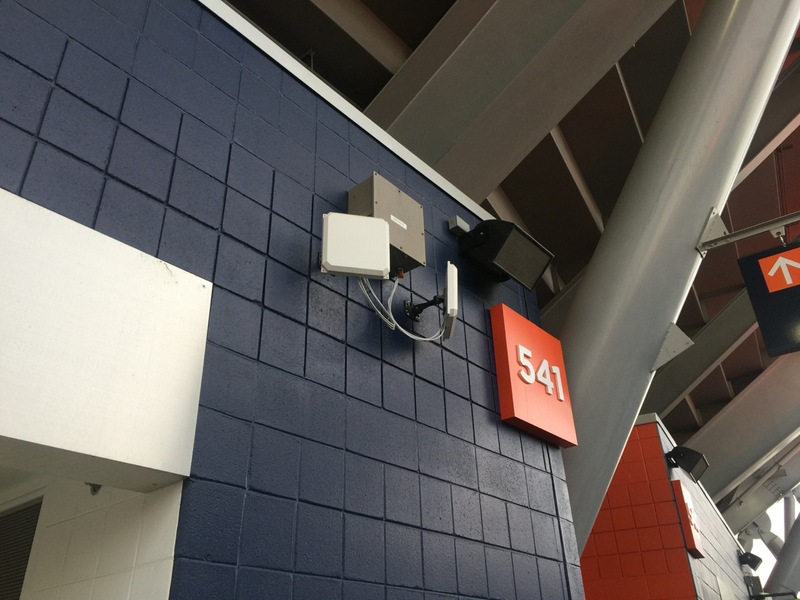 As the Denver Broncos’ Wi-Fi network upgrade nears its final steps of completion, solid coverage around the venue now known as Broncos Stadium at Mile High is producing Wi-Fi data totals averaging more than 6 terabytes per game, according to statistics from the team. 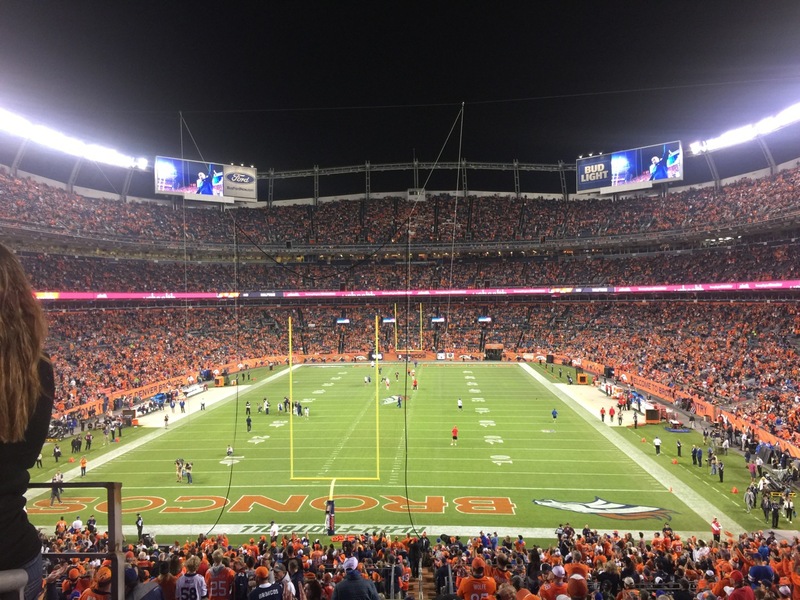 During a recent game-day visit to Mile High, Mobile Sports Report got consistent high-bandwidth readings for Wi-Fi throughout the venue, and into the parking lots as well. 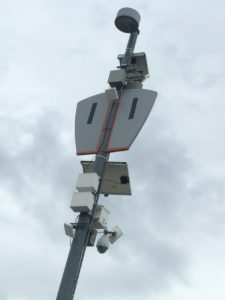 Multiple speed tests recorded bandwidth marks in the high double-digits of megabits per second, even at the top reaches of the stands as well as in other hard-to-cover areas, like concourses and plazas. And even as Russ Trainor, Broncos’ senior vice president for information technology, and his networking team put the final tuning touches on an expansion that will end with somewhere near 1,500 Cisco Wi-Fi APs installed throughout the building, the football (and concert) fans who have shown up lately are already finding ways to use lots of Wi-Fi data. 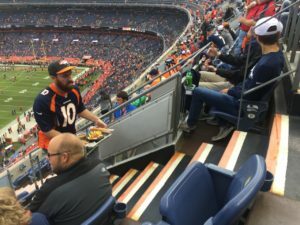 In the first three home games of the Broncos’ current regular season, Trainor said the Wi-Fi network has seen total single-day usage numbers of 6.4 TB, 6.3 TB and 6.2 TB, the latter coming during the exciting Monday Night Football game Oct. 1 versus the Kansas City Chiefs. “We still have a few more APs to add,” said Trainor in a quick interview during the Chiefs game, which MSR attended. And while Trainor added that the team is also planning to step up its promotion of the network, many fans are finding it already, as proven by some other high-water marks this year that include a peak of 32,837 concurrent users during the home opener on Sept. 9; peak throughput of 10.83 Gbps on Sept. 16; and the most unique connections, 42,981, on Oct. 1. Because many of the new APs are the new Cisco 3800 Series with two radios, Trainor is confident the Broncos Stadium network is far from maxing out. “We still have room to grow folks onto the system, and we’ll continue to advertise that network for the fans,” Trainor said. During our visit at the Oct. 1 game, MSR was impressed the moment we got out of our car in the parking lot, when we recorded a Wi-Fi mark of 28.3 Mbps down and 56.5 Mbps up. As a Verizon customer we were automatically connected to the stadium’s Wi-Fi network, one of the perks that came with Verizon’s investments in the Wi-Fi and DAS networks at the stadium. 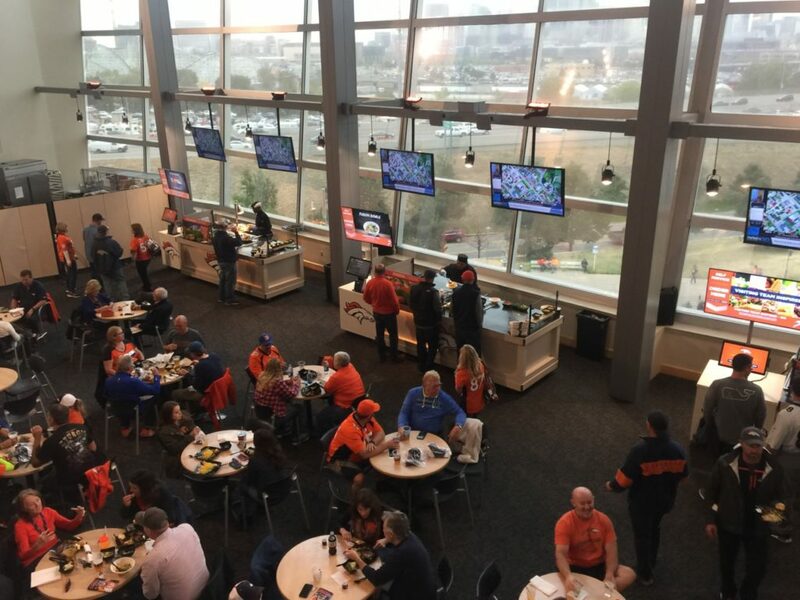 Inside the premium-seating United Club area, we got a Wi-Fi mark of 48.0 Mbps / 70.3 Mbps, even as fans crowded the open dining hall during pregame. 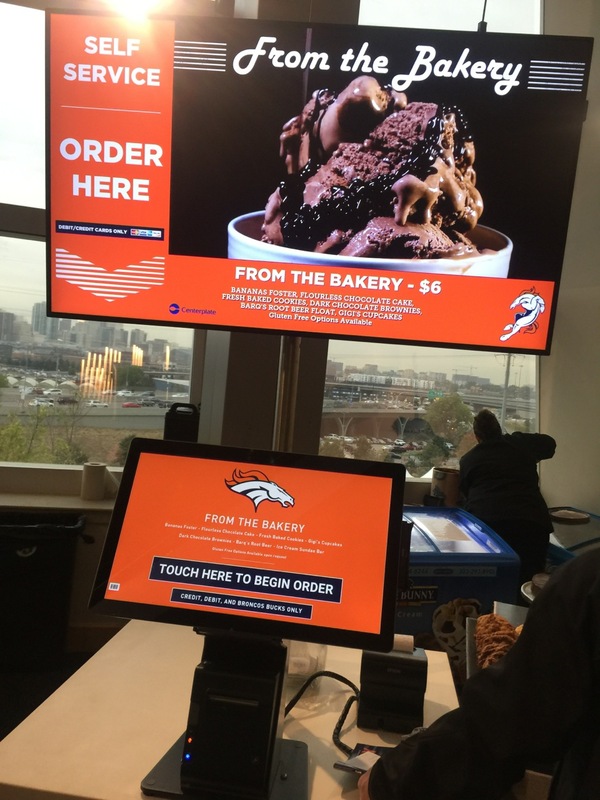 We also saw some cool new food-station kiosks along one wall, each with its own connected display for menu items as well as a touchscreen payment system (a turnkey deployment from Centerplate, Tapin2, and PingHD) that eliminated the need for additional concessions staffers. 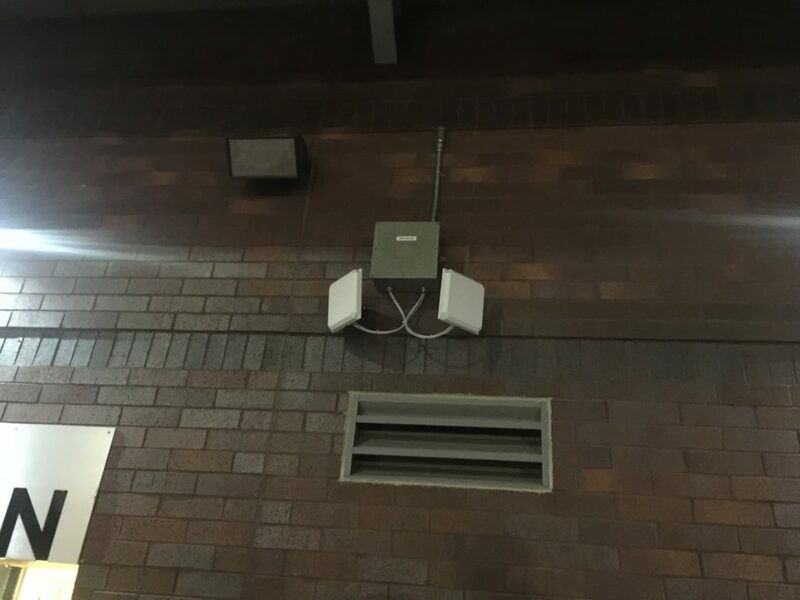 Up on the top-level concourse we saw APs every other wall section with two antennas pointing in opposite directions, coverage that produced one mark of 31.8 Mbps / 68.2 Mbps even as fans crowded the stands to get food and drink before kickoff. According to Trainor the concourse areas will get roughly a doubling of coverage with more APs next year, to support a plan to move to more digital payment methods. 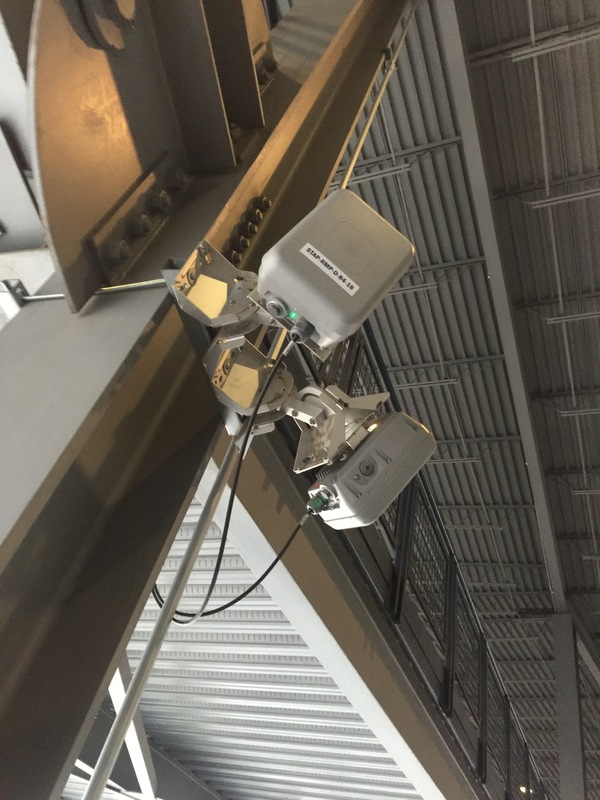 A good look at the hardened, single-cable Wi-Fi APs in the walkway ramps area. 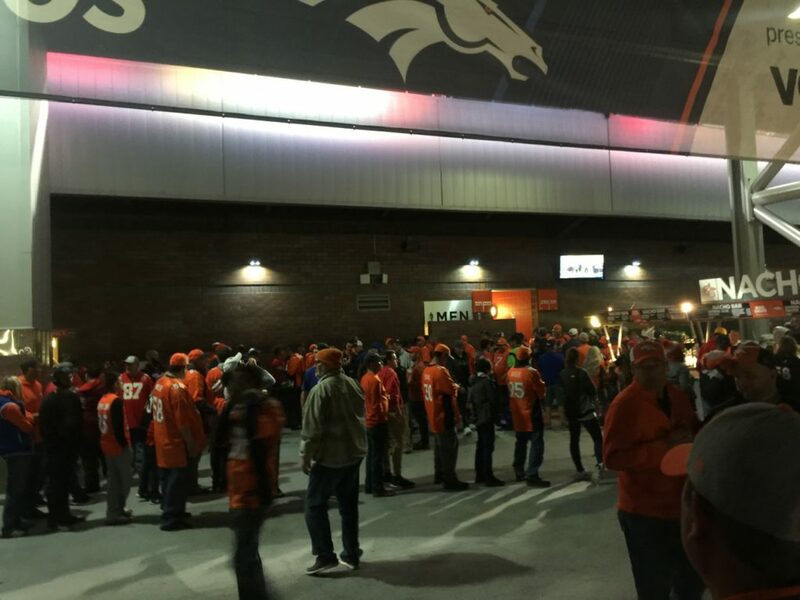 According to the Broncos these use POE (power over Ethernet), cutting down on the conduit needed. Out in the upper-level stands (Section 541, row 5) we got a Wi-Fi mark of 36.0 Mbps / 29.6 Mbps, in an area where we could see APs pointing down on the seats from the top-level light standards as well as in railing enclosures. Some areas in the upper deck are also covered by under-seat APs, which also are used in the south end zone stands where there is no overhang infrastructure. 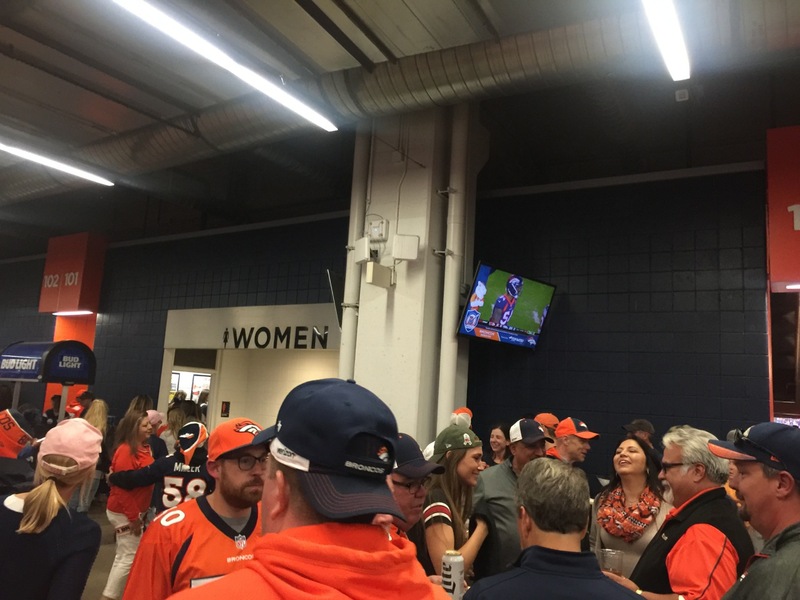 We also got good connectivity in an often overlooked area, the walkway ramps and escalators behind the seats, where the Broncos installed some APs that use power over Ethernet and weather-hardened enclosures since those areas are more open to weather. While riding up on an escalator we not only stayed connected but got a test mark of 26.4 Mbps / 37.6 Mbps. In perhaps one of the biggest stress tests we could find, the Mile High Wi-Fi had no problem keeping fans connected. Just before halftime we planted ourselves on the outdoor plaza behind the south stands, and waited for fans to crowd the area during the break. With a Wi-Fi mark of 38.4 Mbps / 35.7 Mbps second five minutes into the halftime break, we were still able to easily view video highlights of the first half even as everyone around us was using their phones to check email or to connect with friends and family. As the second-half kickoff neared, we walked into the main concourse underneath the west stands and still stayed solidly connected, with a mark of 33.0 Mbps / 59.1 Mbps in the middle of a thick crowd of fans who were either waiting for concessions or walking back to their seats. With a high-water mark of 8.1 TB for a Taylor Swift concert earlier this spring, the new Wi-Fi network in Broncos Stadium at Mile High showed that it’s more than ready for big games or other big events. Some more photos from our visit below! Nothing like Monday Night Football!